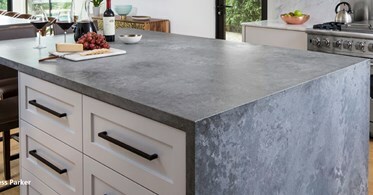 Quartz countertops are a man-made alternative to natural stone countertops..When talking quartz counters names like “Zodiaq” and “Stilestone” come to mind. These very hard granite-like surfaces are formed from 80-90% quartz pieces fused together with a polyester resin in a large extruded bun from which counter-top think slabs are cut and then shaped into the counter tops we are all so familiar with. The resination provides a virtually non-porous, and therefore, stain-resistant surface, however the quartz portion may need to be sealed. As hard as the quartz is, the resin can prove a little softer. This surface is almost as dense as granite but much harder due to the high quartz content. It’s essentially non-porous, meaning it doesn’t easily absorb spills. Making it resistant to staining, etching, and corrosion from substances like wine, vinegar, tea, citrus, soda, fruits, and vegetables. Similar to granite and superior to marble. That’s the good news. The binding resins are essentially non-porous making sealing unnecessary, but the quartz is another story. 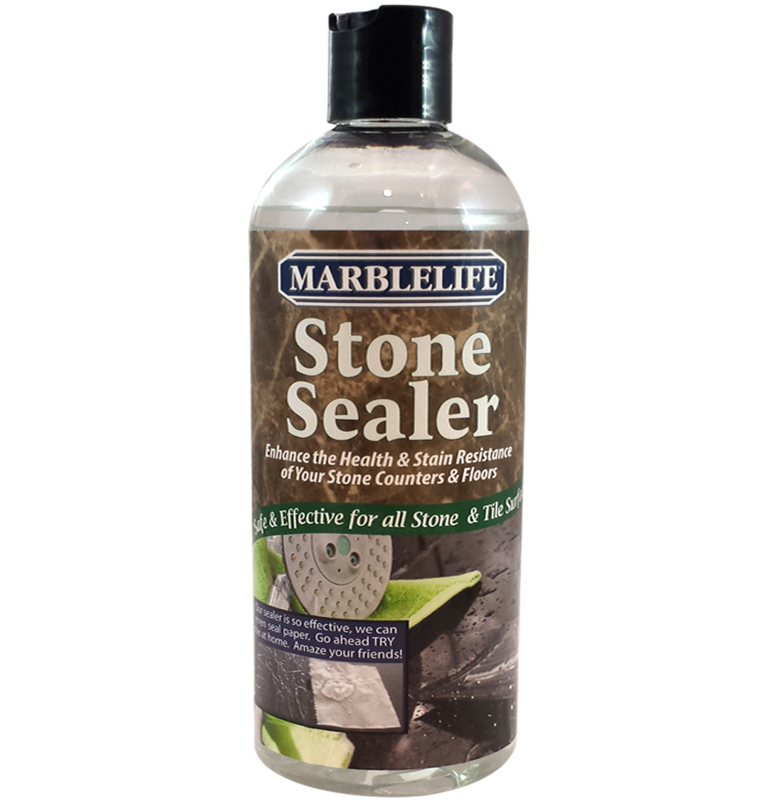 It should be sealed using a sealer like MARBLELIFE® Stone Sealer to keep it protected. Quartz is a hard surface, but not hard enough to withstand something like frequent exposure to sharp objects and knives. Always use a cutting board to avoid accidentally damaging your surface. 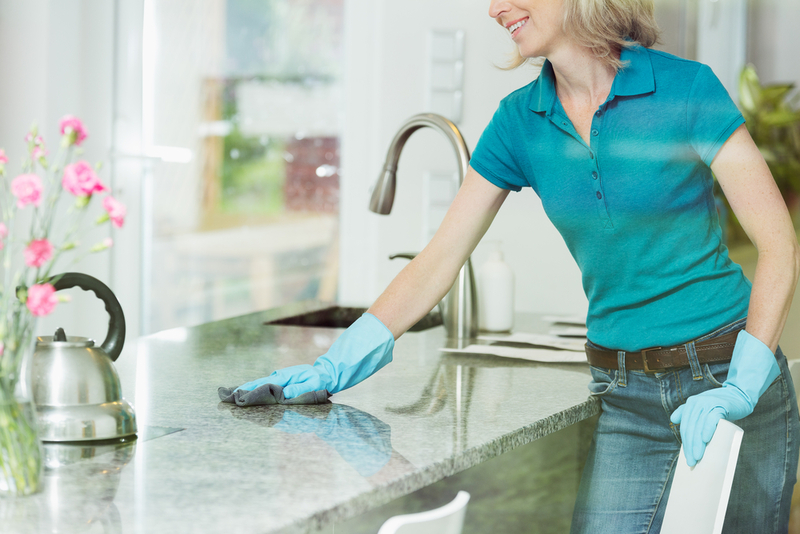 Using a soft microfiber cloth or towel, wipe down the surface with a mild cleaner like MARBLELIFE® Granite & Quartz Countertop Cleaner daily. For any dried foods or particles, use MARBLELIFE Soap & Scum Remover or if the force is with you a blunt scraper (like a plastic putty knife). Just remember that that like any countertop, once scratched a professional repair is going to be necessary. Dry countertops with a fresh cloth after cleaning. Don’t be fooled. Quartz heat resistance does not mean that the resin can take the heat. Never place a hot skillet or roasting pans directly onto your quartz surface, as the resin will burn turning white. This color fades with depth, meaning that while a professional can rehone or repolish the surface and lighten the damage it can extends deep into the countertop surface. This is where a granite surface has its advantage with a more uniform heat resistance. Also, be careful with heat-generating appliances like electric grills or crockpots. Prolonged exposure to heat may cause cracks in these surfaces. Heat is the enemy. Got Zodiaq, Got alligator Skin In you have a Zodiaq countertop you understand what we are referring to when we suggest it has an alligator skin appearance. This occurs as a result of how it is manufactured with the countertop being cut from the extruded bun while still hot. This results allows the resin portion which is cut hot and flat to shrink on curing resulting in a subtle lower resin surface and that signature alligator appearance. The issue can arise when the need to polish the surface to repair a scratch, blemish or replace a missing stone. Polishing effectively flattens the surface, resulting in a polished noticeable area. Have no fear the jedi-stone-masters at MARBLELIFE developed a proprietary technique that can restore that alligator-like appearance by selectively carving away the softer resin areas while leaving the quartz intact. Got Zodiaq, place the MARBLELIFE name and contact info inside your kitchen cabinet door for when that day arrives and a repair is needed.